Tilney BestInvest, now known as the Tilney Group (as of 30th January 2017) is a financial planning and investment company. It has been created by the private equity backed merger of Best Invest, Tilney, Ingenious Asset Management and Towry. Its clients include expatriates, private individuals, families, charities and professionals; Tilney looks after more than £20 billion on behalf of its clients around the world. Tilney Best Invest was acquired by global private equity firm Permira in 2014, with the intention of further sector acquisition and growth. As a private equity firm, Permira’s business model is to provide capital for acquisition and accelerated growth, before exiting to realise maximum profits, either through an IPO or trade sale. What does the data tell us about Tilney BestInvest’s solutions? Which portfolio have you got and how has it performed? 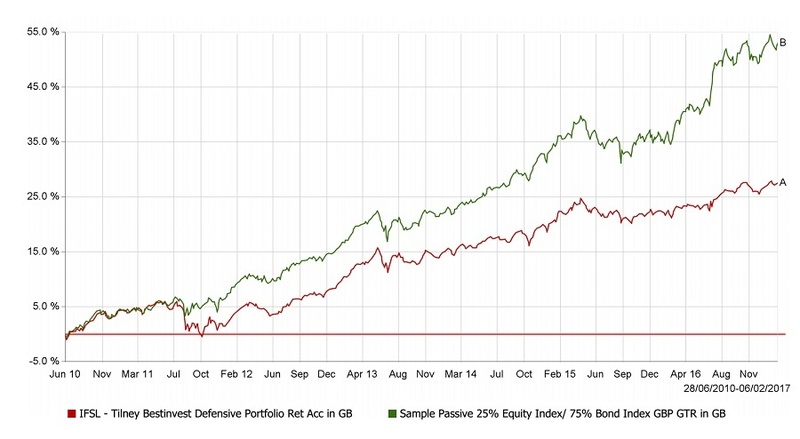 How has the IFSL Tilney BestInvest Defensive Portfolio performed? Are you better off buying a lazy boy/couch potato passive portfolio that tracks the index, or the Tilney BestInvest Defensive Portfolio? How has the Tilney BestInvest Income & Growth portfolio performed? 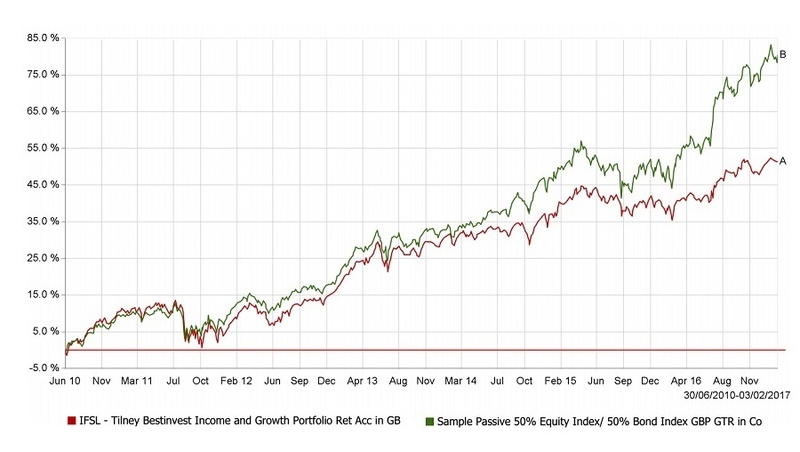 Are you better off buying a lazy boy/couch potato passive portfolio that tracks the index, or the Tilney BestInvest Income & Growth? How has the Tilney BestInvest Aggressive Growth portfolio performed? 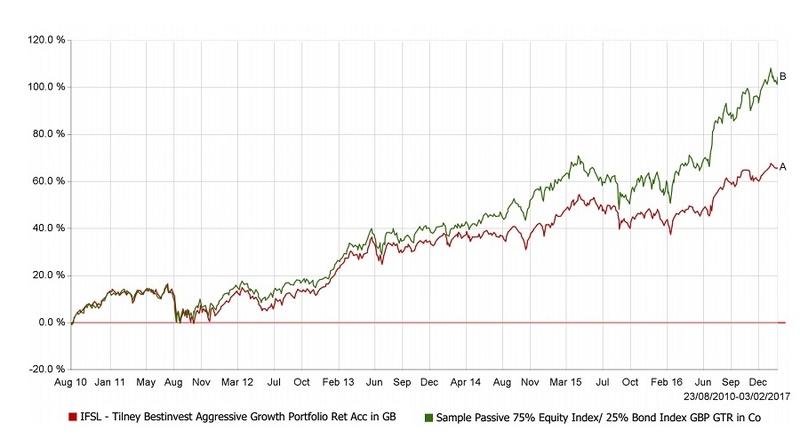 Are you better off buying a lazy boy/couch potato passive portfolio that tracks the index, or the Tilney BestInvest Aggressive Growth Portfolio? Do Tilney BestInvest Group operate overseas? The international marketplace is in many jurisdictions a place where UK businesses can expand, without the regulatory constraints inherent within the UK. Like others, such as St. James Place Group, Tilney BestInvest has entered this market. In Tilney's case, this is via partnership agreements with international intermediaries strategically located throughout the world. International financial service provider Infinity Financial Solutions, which has presence across Asia and offices in Malaysia, Hong Kong, China, Cambodia and Vietnam, has an exclusive arrangement with Tilney for its expatriate clients. W1 Investment Group in Qatar is led by former BestInvest advisers, and also has an exclusivity distribution agreement with Tilney Group. Does Tilney Best Invest they have any exclusivity arrangements? In order to get exclusivity, a firm normally needs to place a broadly agreed amount of assets with the investment firm. There may be a risk that your assets are given to this investment manager regardless of whether or not they are the best option for you. The investment firm splits their annual management charge with the exclusive distributor in what is called a ‘retrocession’ payment. This hidden payment may act as an incentive to place further business with the investment manager, and causes a fundamental conflict of interest. As opposed to finding you the lowest cost solutions, it is highly possible that you get shoe horned into a more expensive option or share class. In addition to hidden retrocession, the investment manager will offer a marketing allowance for conferences, incentive trips and general encouragement. These incentives are banned within the UK and may also create a further misalignment between the client’s best interest and the adviser's. International investors should be aware that an ‘exclusive distribution arrangement’ is likely to be in the investment manager’s and financial saleperson’s best interest and unlikely to be in yours! What are the charges on the IFSL Tilney BestInvest Defensive Portfolio? Because the international distributors place these funds inside insurance wrappers such as Old Mutual International offshore bonds, QROPS and/or contractual savings schemes such as the RL360 Quantum, which may also have high charges, the total costs can often be very substantially greater than these (although lower initial charges may apply). As an investor in this fund, its performance would have to exceed these combined charges for you to enjoy any growth. What are the charges on the IFSL Tilney BestInvest Income & Growth portfolio? This means in year 1 an investor choosing this fund may pay up to 7.14% in charges, thereafter 2.14% per annum. Because the international distributors place these funds inside insurance wrappers such as Old Mutual International offshore bonds, QROPS and/or contractual savings schemes such as the RL360 Quantum which may also have high charges, the total costs can often be very substantially greater than these (although lower initial charges may apply). What are the charges on the IFSL Tilney BestInvest Aggressive Growth portfolio? Naming no names (but you mention them in your review) I was left Tilney was THE best option if not the only option for me. I think I know why now I've seen what's happened to my money - decimated is the word I'd use. This must be a very aggressive firm to get themselves pushed so hard to clients like me? Within the international marketplace, the Tilney funds are typically accessed by financial salespeople through offshore bonds. The total cost of these insurance bonds, the advisers' commission, and the funds themselves potentially create a serious drag on performance, which will impact your returns. It is therefore not without irony that in our view, more cost effective, more transparent and better performing investment options exist for the well informed international investor. If you’re looking for the strongest possible growth on your investments, and you don’t want that to be undermined by high costs or you are uncomfortable with your adviser accessing investments through an insurance wrapper and/or receiving kick-back commission payments, then you may wish to consider alternative options. As an example, index trackers are not only lower cost, but they typically perform better over time, giving you better returns. They don’t, however, pay your adviser high up front commission costs through insurance bonds or ongoing splits of management fees, which is why you often don't get told about them. If you’d like a fee-and-obligation-free review of your current Tilney Group / Tilney BestInvest holdings, or your portfolio as a whole, simply request an X-Ray Review™. This is more than just a second opinion – it gives you the facts about the total charges you have paid, the performance of your funds, and any exit penalties that lurk coupled with clear guidance on your best options moving forwards.